We cover all of Leeds and unlike others, we only charge from the time of arrival, there is no call out fee. We specialise in the smaller jobs and also offer an emergency plumbing service. As well as general plumbing work, you can call us for gas boiler repairs, combi boilers, unvented hot water systems and for blocked drain clearance. If you’re looking for a bathroom renovation we have all of the necessary skills and experience and can source many products at trade prices. As plumbers, we have training and qualifications from the British Plumbing Employers Council and the gas engineers we use are members of the Gas Safe Register. Give us a call, we're available 24/7! A reliable plumber in Leeds is not always easy to find. We are a professional plumbing company who work fast and efficiently to the highest of standards and only ever use materials and products of the best quality. We aim to get work done with minimum disruption to your daily routines, and take great care when working in a client’s home. Wearing shoe covers on our feet and cleaning up when the work is complete, we leave no mess behind. In all of the heating and gas, drains and plumbing work we do, we always strive to give a superior level of service, and where possible offer a same day service no matter how big or small the job. If it goes through a pipe we can fix it! Did a great job when my house was flooding. Would use again. Arrived quickly and had the leak repaired at a reasonable cost. Highly recommended. Great service & advice with a friendly approach. First rate plumbing service I would use again for sure. You’ll be pleased to know our hourly rates are fixed, no matter what day or time of day you call, so call us anytime. If we’re available, having a van stocked with all the most commonly used items means we can often give a permanent fix that same day. Fully insured for all the work they do, plumbers and engineers sent by Leeds Plumbing Solutions always carry ID cards and have decades of experience in their profession. You can call us anytime, drop us an email or use the form on our contact page if you are requiring help or simply more information. Most of the time our local Leeds plumber or gas engineer can arrive there within the hour, if we are unable to send an engineer straight a way we shall be honest and inform you of the next available times. We understand nobody likes to be kept waiting all day and we always strive to arrive on time. We cover Leeds city centre, as far out as Barwick, Garforth, Morley, Pudsey, Wetherby and surrounding areas. 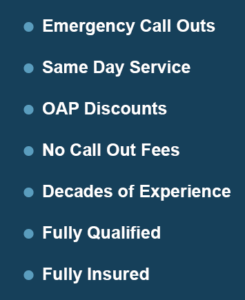 We’re fully qualified for all we do. All plumbing work shall be carried our by bpec qualified plumbers and any gas work by Gas Safe Register Engineers.